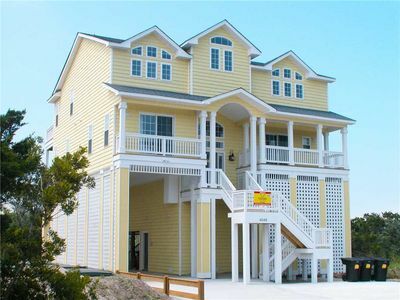 The Sunsetter Beach House! Pool & Home Theater! Nice People Only! THE SALTWATER POOL OPENED APRIL 9th.!! BOOK PEAK SEASON NOW!! YOU CAN MAKE 2 PAYMENTS!! TIME TO MAKE YOUR RESERVATIONS NOW FOR PEAK SEASON!!!! WILL NOT LAST LONG!! NEW FILTERED ICE AND WATER DOUBLE DOOR FRIDGE 1ST.FLR. MASTER SUITE FOR 2019. BOOKING PEAK 2019 SUMMER WEEKS NOW!, SATURDAY TO SATURDAY!! $2795. 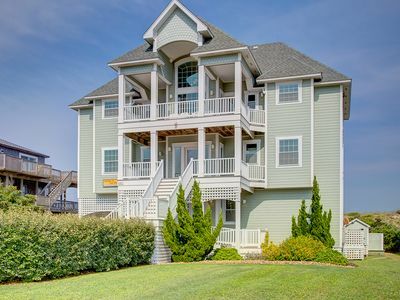 plus NC tax and vrbo fee. BOOK EARLY FOR YOUR FAVORITE WEEK! THE SUNSETTER BOOKS SOLID EVERY SUMMER! 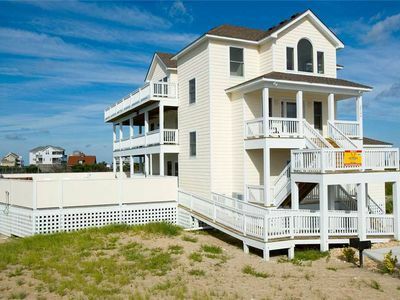 THE SUNSETTER BEACH, POOL & HOME THEATER! BIG, BAD & BEAUTIFUL!! NICE PEOPLE ONLY! WOW! NEW 3rd. FLOOR SUITE! 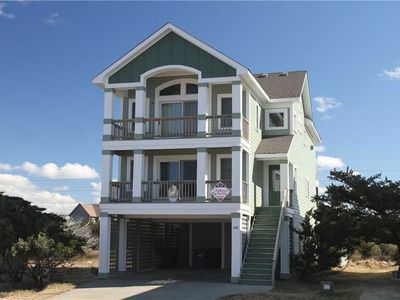 4 BEDROOMS, NOW INCLUDES 2 SUPER MASTER SUITES !! THE SUNSETTER IS N.C. LICENSED ! PICK AND BOOK YOUR VACATION NOW! BEST CANCELLATION POLICY! SEE YOUR LEASE BELOW! FREE HURRICANE INSURANCE! FREE LINENS & BATH TOWELS! FREE USE OF BEACH CHAIRS!.The Sunsetter is in the middle of it all & that's where our guests want to be! Bring your Kayaks & Bikes! Like to make a run in the morning? The NEW NC (FREE) boat & Kayak Ramp and the Bike, Jogging & Walking Area is right down the street with the free pier and Gazebo so the kids can go crabbing. 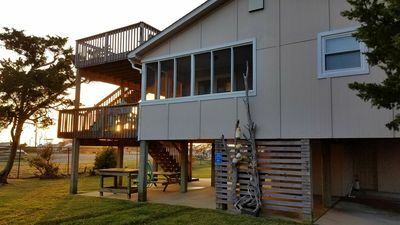 Welcome to The Sunsetter Beach House! Pool and Home Theater! 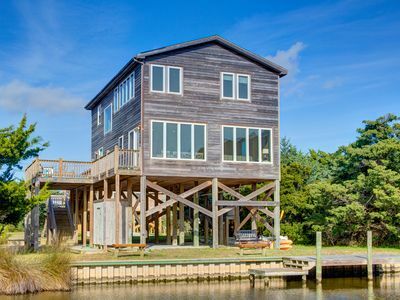 ASK YOURSELF THIS >>>HAVE YOU EVER STAYED IN A VACATION HOUSE WITH 2 SUPER MASTER SUITES? 1ST> FLOOR>>>Great for 2nd. Couple or grandparents that want their pleasure and private time. Enjoy the Direct TV on the 65" Home Theater located on the 1st. Floor very private suite. 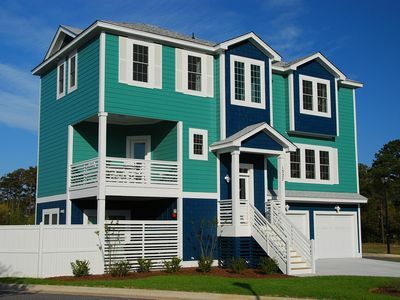 This 800 sq. 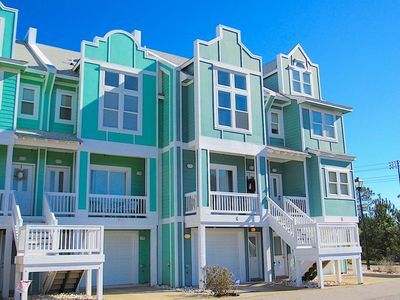 ft. SUITE alone is as big as many beach box houses listed on vrbo! KING BED AND GALLEY with Fridge, Microwave, Coffee pot, Dishwasher, DINING AREA!! DIRECT ACCESS to POOL, LIVING AREA with Couch, Dual Reclining Love Seat , Chair and back door which leads to an outside Fun shower also. Parents be safe...The 1st. Fl. Suite do NOT allow your children to stay on the 1st. floor due to direct access to the Pool and thus no direct inside access to upstairs. The 2nd. Main Family Floor >>>> Has a 50 " Big screen in the living area. Whole House dependable WiFi! Designed for pleasure! Great Queen Bedroom with direct private access to Full Bath. 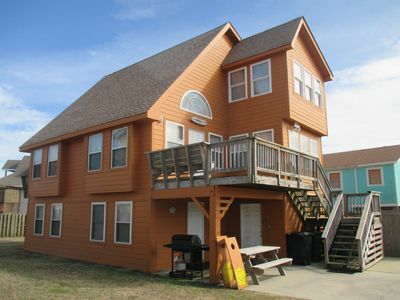 2 Reclining Chairs, 2 Reclining Love Seats and Couch.2 Dining areas plus Breakfast Granite Bar with chairs.Full Kitchen. 3RD. 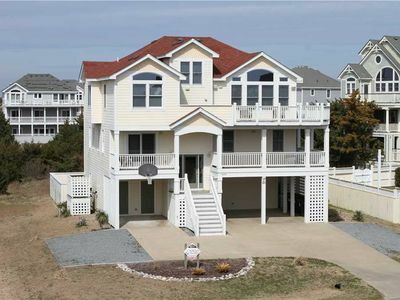 FLOOR>>> Bedroom with TWIN BEDS and Direct access to outstanding FULL Bathroom. PLUS, The NEW Super Master Suite is actually 2 rooms with 50 " TV, Queen bed, Couch, Love seat, Table and 2 Chairs for 2. ALSO equipped with K Cup Keurig coffee maker. >>>IMPORTANT! !~Need Help? Just email me. YOUR LEASE>>>>THE Following IS YOUR LEASE! It's easy, simple! IMPORTANT! I cannot complete your Booking without YOUR LEASE .When Booking YOU MUST AGREE TO THE LEASE. IMPORTANT!! YOU MUST WRITE ON YOUR CHECK, >>'WE ALL AGREE TO THE LEASE'. Please no smoking, ABSOLUTELY NO PETS, NO school groups & no parking on the lawn. We cater to families and mature adult groups. We cannot hold your vacation dates without a payment. Please leave The Sunsetter neat and clean upon your departure. 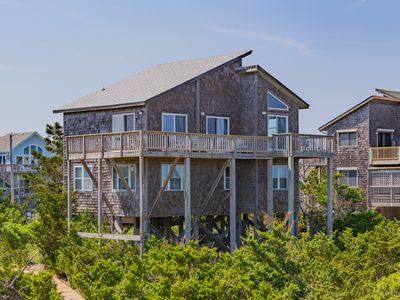 Most fires on the Outer Banks are caused by appliances left ON while people are away. Do not leave stove or any appliances on when not at The Sunsetter. There is no lifeguard for pool, kids must be supervised at all times. 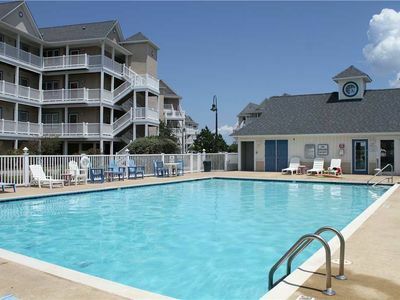 You and guests are responsible for The Sunsetter, Pool and also all injuries. All pool rules must be followed. Absolutely NO DIVING. Comply with local, county & NC rules...No glass in pool area inside the fence..You Must use cans or plastic. Put umbrellas down when leaving pool area and put bungee cords on them due to high prevailing winds at night. Keep Pool gate locked at all times and especially at night and when gone.. 1st. floor Master Suite direct access Door to pool area needs to be locked when pool is not in use. There are two buzzers and slide bolt at top of the door for extra safety to help keep kids from the pool area..
Free Hurricane Insurance~In case of Hurricane Mandatory Evacuation, you agree and must leave. Make up nights will be approved. YOUR CANCELLATION POLICY>>Cancellations will be made at no charge up to 90 days prior to vacation. Less than 90 days you will be refunded when your week is resold. If not resold you will get a credit. Off season rates do not include holidays. CHECK IN is 3:00 pm OR After. CHECK OUT is 10:00 am or earlier. Trash must be emptied and put in dumpster at street on Monday and Thursday nights for pickup the next morning. You cannot get up early enough to get the trash out if you forget the night before. Trash bags are under sink. Poolside trash can needs to be emptied along with other trash cans The trash truck arrives very early. All food must be removed from refrigerators.Please wipe out refrigerators. kitchens and bathrooms must be cleaned. vacuum cleaners are located on all three floors. Lock your doors and leave all keys on the kitchen counter. Leave Pool key on the Fish above the kitchen counter. You and your party agree to take good care of The Sunsetter. Any disputes between parties that can't be settled between the two parties will be settled in Dare County, N.C. court. Also, you agree to pay any damages in excess of $150.security deposit. Booking is easy & with no hassles! Check our calendar & BOOK your favorite DATES NOW! POOL OPENS APRIL 15, 2018 & The POOL closes Oct. 16th.. 2017. Plus, the BONUS easy to use Solar pool cover is always available for your pool pleasure. BOOK with confidence! Free Hurricane Insurance always! BOOK NOW for best week! SORRY, NO PETS. Booking is easy. Check our calendar and book your favorite dates now. Pool opens APRIL 15, 2018 and Pool closes October 16 2018. Plus bonus easy to use solar pool cover is always available for you. >> The VERY PRIVATE 1st. Floor is the 800 sq. 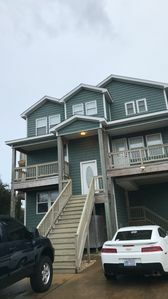 ft.Super Master Suite W/ NEW KING BED for 2018 !! NEW 65" Super Flat Screen Home Theater!! New, dual reclining Love Seat & Pull out couch..Galley w/ new fridge, dish washer, sink, microwave. Also, New lady's makeup area & Wireless Laptop Desk .BRING YOUR WIFI laptop! Easy access to the outside private shower. Your own private side door access to the pool with privacy fence for coffee & your morning leisure swim. >>The 2nd. 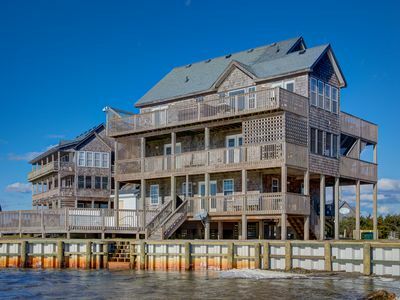 floor ( main floor) The living room with big screen, Bathroom, Deck, 2 comfortable Barca Lounger recliners & High end Sterns & Foster comfortable couch! Plus 2 new dual reclining love seats, ( Total 6 reclining seats), 2 dining areas, ( Granite kitchen & breakfast counter w/ 3 chairs, New Microwave, New Stove & Dishwasher!, NEW Queen !! PLUS!! 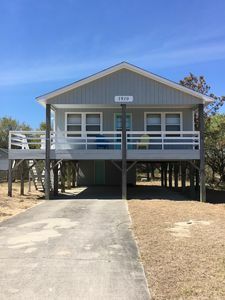 !>> ENJOY YOUR MORNING COFFEE IN YOUR 260 Sq, Ft.QUEEN MASTER BEDROOM SUITE & SUNSET ROOM with a very comfortable queen foam bed!, Couch, Love Seat, table for 2 & more! ! >>>POOL OPENS APRIL 15.~Oct 16th closes., The Solar cover will trap & store heat at night and make heat during the day.Think about it for a moment. Beach Time & coming home to the Pool! Dining out or just cooking out on the gas stainless grill. Joined the Sunsetter VIP CLUB yet?? Get on board! ~Free Hurricane Insurance! Protect your vacation investment! PLEASE! Bring your beach towels. Please...Do not take bath towels to the beach or pool. Beach Chairs provided free!.~Easy no hassle booking!~DIRECT TV! & WI FI! PLUS HOME THEATER!~No back & forth paper work~*No wasted time. NO lengthy check in! 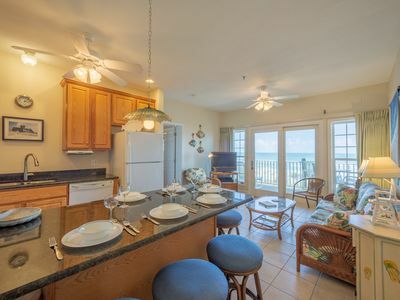 You come directly to The Sunsetter & start your vacation!! We are better. Let's be specific about the Saltwater POOL! Ladies, please note. Your skin & clothing Is Important to you ! This is the upgraded Salt Water Pool so forget the harsh chemicals of the chlorine that dry out your skin, fade your swim wear & hard on your hair! An amazing fiberglass pool with 3 love seats & 3 LED night lights (pick the color you like best) that make the warm summer evenings a little more fun! For your swimming pleasure the pool is cleaned TWICE a week! 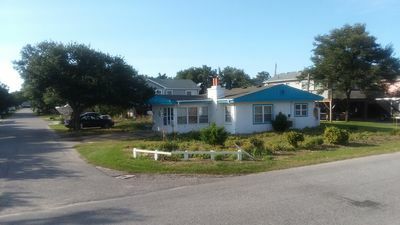 The Sunsetter is in a great location, just a few minutes to the beach (750 yards) back just enough so you don't he. Plus an added bonus!! Hayman Beach Access! Your beach day is complete & while at the beach you can also walk to the pier Best of both worlds! 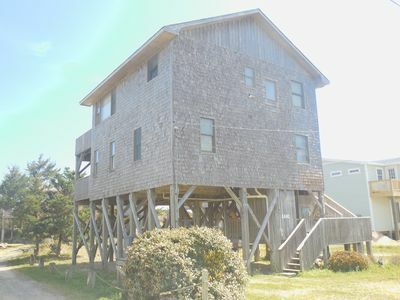 3 floors of great vacation fun! Here's our The Sunsetter VIP program just for you!. The Sunsetter offers our exclusive VIP Program, which is/after your first stay (leaving The Sunsetter the way you found it) which is clean & neat... No more security deposits on returning stays. 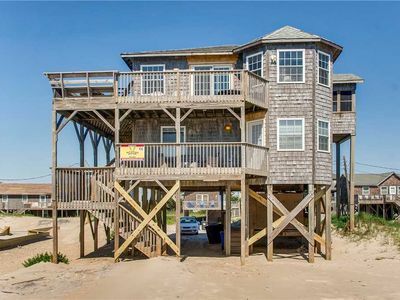 (Security deposits are a hassle for you & us both) NO ONE does this anywhere on the Outer Banks! We have trust & faith in our responsible VIPS & Do reward all of our returning clients. FREE Hurricane Insurance! If Kill Devil Hills has a mandatory evacuation, you agree that you will leave, you get free make up time!! This season or next in the same time frame!! Please BOOK EARLY..so you get the week you & your family want!! 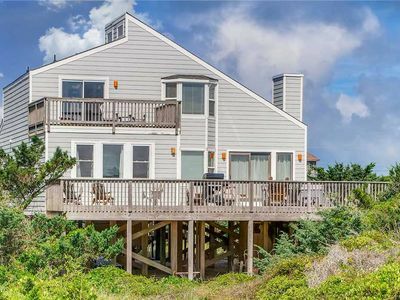 In The Heart of Hatteras Village. 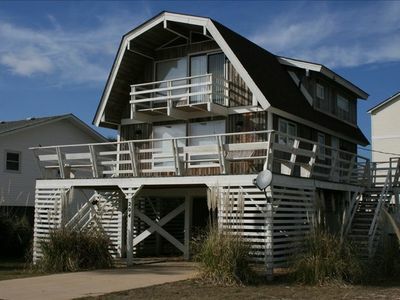 Close to Beach, Restaurants and Marinas.